For ‘Open Heart Surgery’ Jesse Wine presented a selection of new works made over the eighteen months preceding the exhibition. 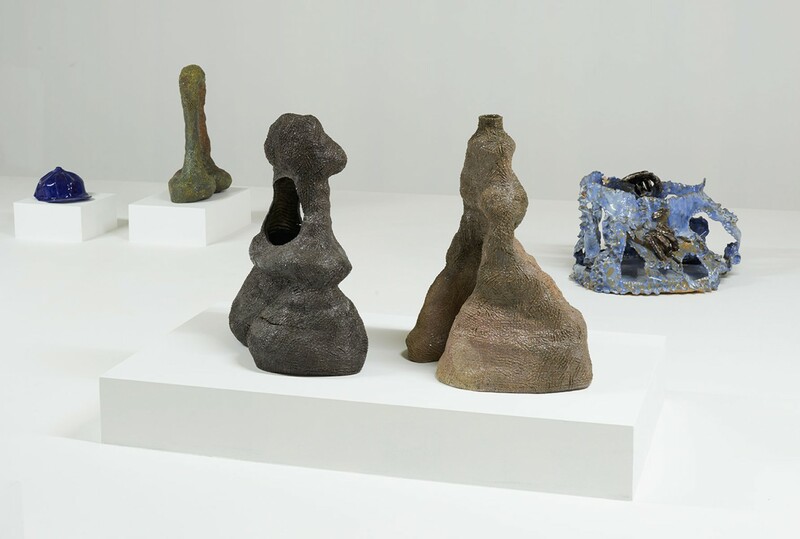 These abstract forms, amorphous platters, roughly modelled and painted heads, candle holders, and figurative containers track changes in the artists practice over that period of time. They showcase a range of material treatments – from detailed crosshatching to weathered, matted, and running paintwork, seeping glazes, and forms collapsed or folded in on themselves. 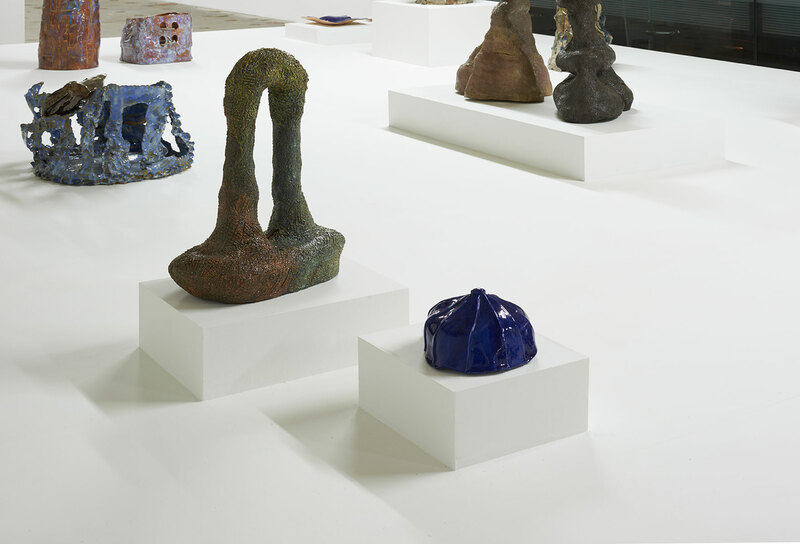 The works are installed like a collection of cultural artefacts across a single large plinth. 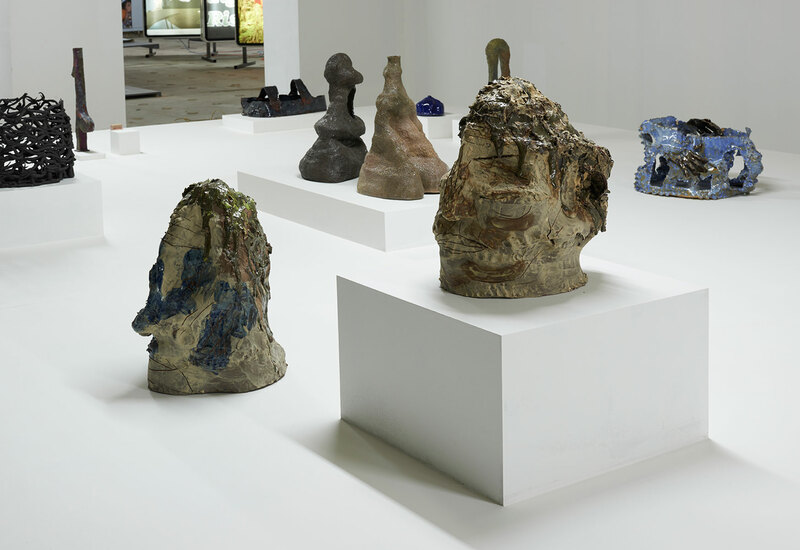 Inspired by modernist architecture, the plinth’s upper surface is raised in response to each objects it holds, showcasing the artist’s affinity for bringing vernacular elements to play against firmly established taxonomies of the museum. The question of originality – how the individual’s creative signature transcends the culture that arises from – is of particular interest to the artist. 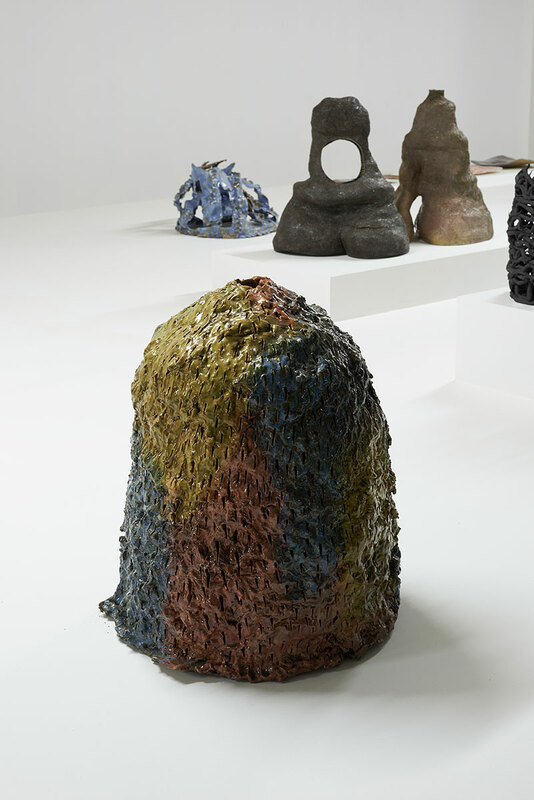 He cites Ken Price, whose work shaped the development of both contemporary sculpture and traditional ceramics, as having had an enduring influence on his work. As in his’ ‘autobiographical take on the medieval histories of his hometown of Chester or in titles such as ‘You can’t get it in the UK’, ‘Modern Tone’, ‘River Island’, and ‘The whole vibe of everything,’ Wine brings a new breath of life into modern and historic design archetypes. Craft has been described by theorist Glenn Adamson as a mirror image of the industrial, the opposite of progress. Wine employs this ‘backwardness’ as a site of accumulation in which art, artefacts and popular culture align – their forms reworked in a curious interstitial space that is wholly his own. Jesse Wine (b. 1983, Chester) is an artist living and working in New York. He received his MA in Sculpture from The Royal College of Art, London and his BA in Sculpture from Camberwell College of Arts, London. 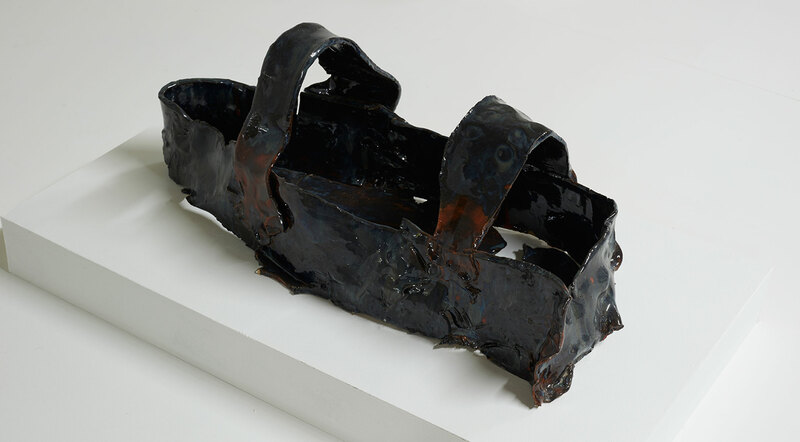 In 2013 he was Ceramics Fellow at Camden Arts Centre, London. Selected solo exhibitions include Museum of Cambridge, Cambridge, 2017; Parrasch Heijnen, Los Angeles, 2017; Mary Mary, Glasgow, 2016; Gemeentemuseum, Den Haag, 2016; Soy Capitán, Berlin, 2016; Limoncello, London, 2015; BALTIC Centre for Contemporary Art, Gateshead, 2014; Galerie Éric Hussenot, Paris, 2014. 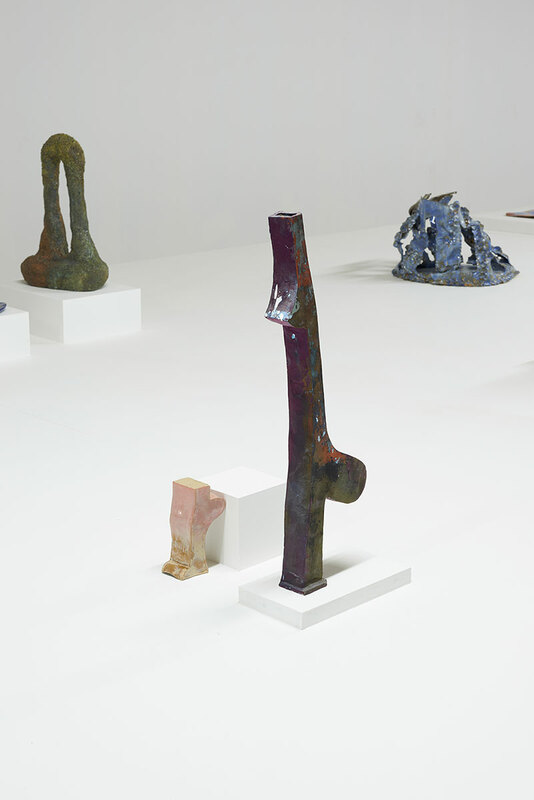 Recent group shows include Walker Art Gallery, Liverpool, 2017; Andrea Rosen Gallery, New York, 2016; Fundament Foundation, Tilburg, 2016; BolteLang, Zürich, 2015.